I have seen the family birthday calendars on printers and been wanting to make one for a while. To be honest, I’d love to make one for my home. But we decided to make one for my mother-in-law this last Christmas. My husband is the youngest of eight children, almost everybody is married, and almost everybody has at least one kid. So total there were nearly 40 tags that we wanted to include on the calendar. 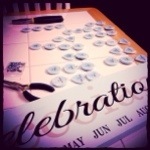 I found an Etsy shop called Custom Vinyl Decor that sold the birthday calendar kit. They were incredibly helpful and super fast. I look forward to shopping there in the future! 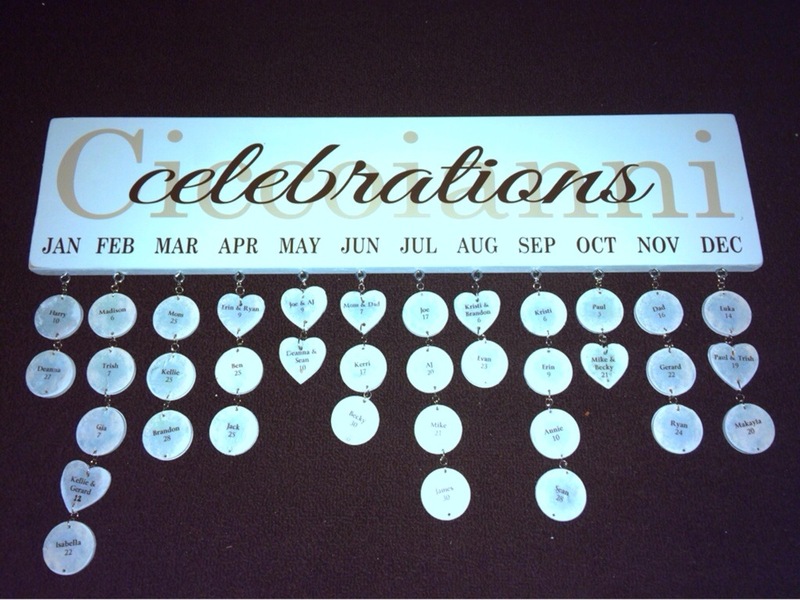 The kit included the vinyl cut out with the family name and the word celebrations, as well as 25 tags and hooks to hang them onto the board. We had to get our own board, paint it, and because our family is bigger, we needed to find more tags and hooks. And searching for the little tags which are made out of wood, I found some heart-shaped ones and decided those would be great for the anniversary dates. I don’t have the most beautiful penmanship, so I decided to print the names and birthdays from the computer, then mod podge them onto the wooden tags. I found a one and a half inch circle hole punch, so it was an easy job punching out the names and months to apply to the discs. It wasn’t quite as easy cutting out the hearts to look right, but in the end I was very pleased with the way everything looked. I used some of the same paint from the plaque itself on the edges of the tags, that brought everything together making it look the right color and very very pretty. We had our board printed, all of the tags were painted and had their names on them. And that’s where the real “fun” started. I put the word fun in quotes because that’s the last thing it actually was. Putting the little rings onto the discs was super hard. We had to use pliers to open the ring slip it through the holes then close the rings. Then we needed to link them together and make sure they close tight enough that the disks wouldn’t fall apart. The whole process took a long time and was very tedious. My husband and I did it together, though, and the moral support of doing it together made a big difference. Once completed, it looked beautiful. Of course we wanted to wrap it since it was a Christmas gift. And in the process of wrapping it, several of the chains fell off the board. We would reattach it, try to attach a better this time. Than restart the wrapping process. When my mother-in-law opened it on Christmas I think one of the months fell off. But we came prepared in my husband was able to pull out the players from the diaper bag and fix it in a snap. 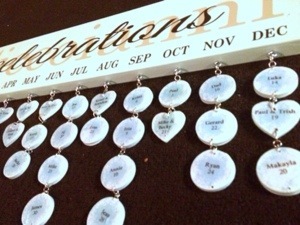 In the end, I think it was a beautiful gift and a very fun way to commemorate the whole family and all of the wonderful milestones we have every month of the year. But, I would definitely start more than two weeks before Christmas. I think if I given myself a month or so to get it done, it would’ve been a much smoother process. I still want to make one for my own home, and I might include birthdays on both my husband’s side of the family and my side of the family. It really is a wonderful visual aid in helping us see what a beautiful family we have and how blessed we are. Why hello, it’s been a while.